"Only working dogs are real dogs!" Also I was looking at Laurelin's Papillons, I mean who doesn't, theyre adorable, and if you squint they look very spitzy. I think they could be sled dogs, you just need a smaller sled. It's all a matter of scale. You know, I think you may be right. Maybe they can cart around my chinchilla so she doesn't have to walk! OK, now I've plowed through this thread and given it a lot of thought. My dogs definitely don't match my decor. They are beautiful and my decor is best described as "distressed by child abuse" To clarify, the children aren't abused, the decor is. I have a beqagle and a coonhound. If I put them to work I take it I will have a steady supply of bunnies and raccoons. If I go into business, does anyone want a coonskin cap? You Chazhound people need to help me out here, I want to keep the dogs and we already established they don't match the house. I think I know how to cook rabbit, but does anyone have raccoon recipes? Are they even edible? We wouldn't want to be wasteful here. But then it won't be a real chinchilla and we'll have to start all over. Though I don't want to think about what you have to do to the chinchilla to make it real. By the way, while I was typing this my Minnie, real or not, ate my shoelace, on the shoe I am wearing. She's a nice tricolor, anyone decorated in black, tan and white? I want to keep the dogs and we already established they don't match the house. A little spray paint and they will match just fine! I think you Dizzy can not stand that fact and quickly tried to get this into a morals debate or stir up something so you can rant at our bad behavior. This is meant in the nicest way possible... but you ALL need lives! haha... i cant keep up with this thread... everytime I go do something it is like 10 pages longer. Tommorrow is my last day of college ever, I have tests to study for and a moot court to get ready for and I have to keep coming back here to check on these threads. I wonder if people are actually born toxic or if they have to take courses in it. 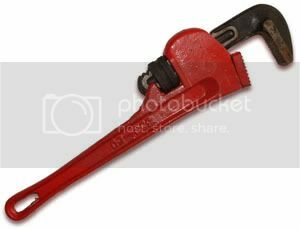 Ummmmmmmmmmmmmm......is that a monkey wrench??? HA! See your just as bad! With the toxicity, I think it's neither birth nor classes, but practice, practice and more practice. So if you start working on it now, you too can be toxic. It was thrown in the engine and the fun is over of course. I need the fun! Debates on other forums are stressing me out. Ok then! Resist the wrench! Let's decorate!